← NaNoWriMo 2013, a week in. 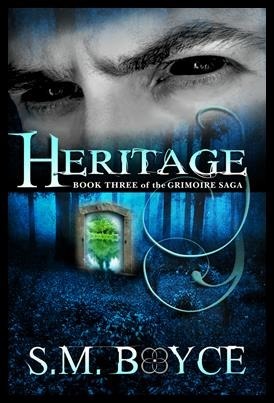 Heritage is the third novel in the epic Grimoire Saga. A hand reached around Kara’s waist and tugged her closer. Her body shifted over cotton sheets. The hem of her nightshirt caught and inched upward along her back. Hot breath sailed down her neck, setting her nerves on fire. She snuggled into a bare shoulder, her nose brushing against bumps of muscle as she itched to get ever closer to whomever held her. Warm skin burned her cheek. A second, thick hand brushed hair from her face. Her blond locks fell over her shoulder like a sheet of silk. Kara opened her eyes. A haze clouded the corners of her vision—the edges of a dream. She frowned. There was no fun in knowing none of this was real. It just meant she wouldn’t be able to enjoy it as much. Braeden smiled down at her. A few dark hairs fell across his olive face, blocking her view of those black eyes that glittered with mischief. He pulled her a little closer with his rough hands, even though no space remained between them. Her frown dissolved. Every bit of her crackled with energy. He ran his fingers along the hem of her shirt, pulling it higher. She faltered and glanced down at the mattress. Of course she couldn’t leave. Not even a month ago, she discovered she was an isen—a creature that could steal souls. Though she hadn’t even known what an isen was before she discovered the crazy world of Ourea, she had apparently always belonged to the hidden realm of monsters and magic. Her mother passed the isen gene to her, and their bloodline had a terrible curse: power and magic came easily to them. It sounded great at first, sure, but the power came too easily. Kara couldn’t control herself. She could kill with barely any effort. Every day, her control dwindled a little more. If she used the air to turn a page in a book, she ripped out the sheet instead. If she tried to hit a target with her favorite attack—red sparks that danced through her fingers like lightning—she blasted the target to bits. She refused to spar with anyone for fear of what she might accidentally do to her opponent. 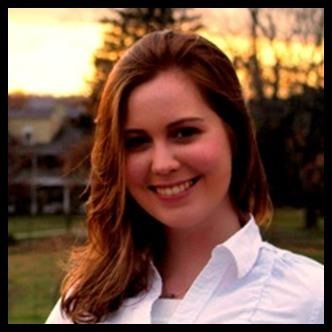 After she discovered she was an isen, she’d spent every second of free time with her mentor, Stone. They traveled to a safe place to train: her village, the one she inherited from the ancient ghost who had given her the Grimoire. Kara hadn’t left the village yet only because she couldn’t do anything without destroying something. “You’re right, I guess.” She smiled and slipped her arms around him in return, burrowing her face into his torso. Her fingers tightened around his waist. Something shifted in her palms. A sharp crack cut through the dream. The crash of breaking glass rocked her. Braeden tensed in her arms. Kara pulled away, trying to figure out what was going on. Braeden studied her, his smile gone. A fissure inched along his face as if he were porcelain and she’d dropped him. It splintered, dividing his handsome features into pieces. His eyebrows shifted upward, likely to question what was going on—or worse, what she was doing to him. Kara gasped. Oh, Bloods! have I hurt him, too? She reached for him, unable to form words. Fragments of his shirt broke away like ice in her hands. The cracks in his face widened. Kara bolted upright in bed, her scream lingering in her chest. White light swam in her vision, blinding her. Something crashed again, as if on replay from her nightmare. Glass tinkled. The wall vibrated with the thump of a heavy object ramming it with great force. A breeze ruffled her hair. Chills raced down her back. She shivered. Salt stung her nose, as did the sweet tang of honeysuckle. Her fingers tensed, grabbing handfuls of the cotton bedspread as her vision blurred. Bit by bit, her familiar bedroom in the Vagabond’s village shifted into focus. White walls. Wooden bed posts. Silk blue canopy over her bed. White comforter. Cotton sheets. Two mahogany bedside tables. A stack of paper on a desk in the corner. The pages shifted in the breeze, and a couple drifted to the floor. Sunlight streamed through the windows on her left, catching on the jagged edges of a broken window. Wind rattled the drapes, shuffling them aside as it whipped through the room. Shards of glass littered the floor, glinting. A red brick lay on the carpet in the middle of the pool of broken glass, a white piece of parchment tied around it with a string. Kara jumped out of bed and tiptoed across the remnants of her broken window, though it didn’t matter if she cut herself. She knew plenty of charms to heal a cut well enough to leave no scars. She picked up the brick and yanked the note from the baked clay. A few words covered the other side of the small square of paper, written in tight handwriting. We’re done with the basics. Your real training starts today. Meet me in the clearing in the forest behind the kitchens. You have much to learn. “Couldn’t he just knock?” she muttered. Her pulse settled. Adrenaline dissolved in her veins. She took a deep breath to clear her head, and the cold air swirled in her chest. Her worry hadn’t been anything more than the panic of being woken from a dream. She sighed. And until the interruption, it had been a wonderful dream. Something squeaked by her bed. Her tiny pet Flick stretched from his place on the pillow beside hers, his bushy tail straight up in the air. His ears—still too big for his head, even though he was mostly grown—twitched as he shook himself awake. No bigger than a squirrel, the furry red creature hopped along the folds in the blanket, battling the valleys of fabric on his way to her. He burped in answer. Charming thing. Kara focused her attention on the broken window. She hadn’t fixed a window before, but she could manipulate the air and start a fire with the magic coursing through her. Since the glass just needed to be fused back into place, fixing a window couldn’t be too terribly difficult. She reached her fingers toward the shards. With a deep breath, she borrowed the breeze dancing through her room. Tension pulled on her hands, dragging her knuckles downward. She resisted, pulling back to lift the fragments of glass. The pieces hovered. Her palms warmed. The shards slid through the air, and Kara directed traffic as best she could. When bits of the glass pushed into their neighbors, she focused the full weight of her gaze on the seam, fusing the pieces on contact. In a matter of seconds, her window was once more whole. A little worse for wear, perhaps—she hadn’t quite gotten rid of some of the cracks in the pane—but solid nonetheless. She smirked with satisfaction. A dull pain throbbed in her wrist. She scratched at it, her nails catching on leather. She sighed and resisted the impulse to rip off the wrist guard on her right arm. The ornate leather band on her right wrist covered spikes that dug into her skin, helping keep her uncontrollable magic at bay. Her arm ached when she wore the thing, but even her grandfather, Agneon, had worn the band at one point to restrain his magic. After Stone awoke her isen nature, he told her to never take off the wrist band for fear she would lose her last ounce of self-restraint. So far, she had obeyed. She headed for her closet to change. However good Stone’s intentions may have been, he’d forced her into the life of an isen. She hadn’t wanted any of this. Since he turned her, Stone was her master and could control her. He could make her hit herself in the face if he wanted, but she listened to him out of respect. He’d lived for centuries. Still, despite his vast knowledge and experience, she would give him a piece of her mind when she found him.